Sunday Worship each week starts at 10:00 am. Join us in the Fellowship Hall every Sunday right after church for refreshments and a time to meet and connect with our church family. Our church is located in the Logan Square neighborhood just a block north of Logan Blvd. We have reserved parking, designated with orange cones, on Logan Blvd between Francisco and Sacramento to provide more spots for people to park. We recommend that you arrive a little early to make sure you can find a place to park. We offer ministry to children and youth during our 10:00 AM worship service. Find out more about what our Children’s & Youth Ministries offer on our Children’s & Youth Ministry page. If it is your first time visiting our church, please arrive early to check your children and youth into our children’s and youth programs. Our Sunday morning worship services are designed to allow a diverse array of people from various walks of life, in different stages of their faith, to come together to worship the One who unites us: Jesus Christ. 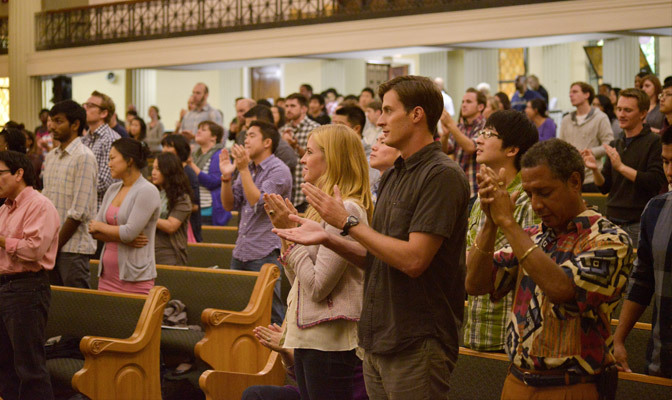 Each worship gathering begins when you’re greeted at the doors of the church and continues in the sanctuary through a time of vibrant worship through song, culminating in a Gospel-focused message. Come dressed casually, open to hearing from God, and ready to respond in worship! Whether you have been walking with God for a long time, are curious about Jesus Christ and have never entered a relationship with Him, or have walked away from church–wherever you are in your journey–we hope you will find a safe place at New Community to encounter the gospel of Christ and learn what it means to be in relationship with Him.